So easy to grow, supplied as tubers, packed full of energy to burst into growth in Spring. Producing a mass of colours which will pepper your garden like gemstones into Autumn. Each pack will reach 60-90cm tall, and produce 20-30 flowers each. They will survive milder Winters, or the tubers can be lifted and kept dry over-Winter. 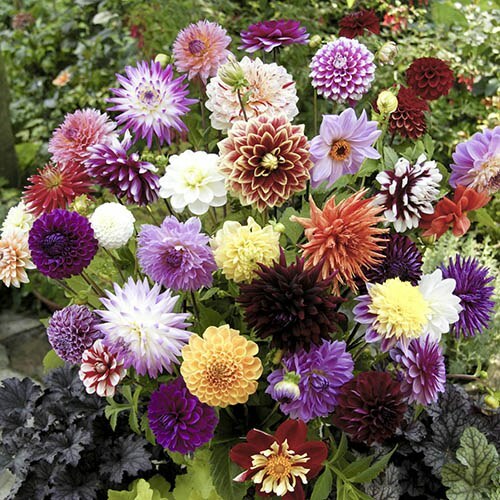 Whilst you may have a perception of dahlias as being old-fashioned, and what granddad grew when you were younger, they are enjoying a renaissance in the last few years, as they provide such stunning colour and value for money in the late Summer and Autumn. So easy to grow, as they are supplied as tubers, packed full of energy to burst into growth in Spring. Plant in pots or in the garden, they will get away quickly from May, and produce a mass of bright colours which will pepper your garden like gemstones as Summer turns to Autumn. Each pack provides 10 mixed colour and shape tubers, which will reach 60-90cm tall, and produce 20-30 flowers each. These can be cut for the house, or left to enjoy outdoors. Dead-heading will prolong flowering well into Autumn. They will survive milder Winters, or the tubers can be lifted and kept dry over-Winter, or left in pots if you choose them to grow. Old-fashioned Dahlias - a great addition to any Autumn garden. Supplied as a pack of 10 large tubers in a mix of colours, shapes and forms, a random mix.